paprika – Damn, I Can Make That! Can I just tell you, I freaking LOVE LOVE LOVE the Morrocan chicken salad at CPK (You know California Pizza Kitchen, yes food blog people DO go to chains) Anyway, I am obsessed with it, BUT its SOOO expensive! Literally, I spend $16-$18 on the salad (the range is because the tax/tip usually makes it $17) which is totally cray to spend on a salad and yet I do. A) because of the convenience of grabbing it after work en route to my night MBA class B) because it is beyond delish! It has all the taste bud pleasing elements you can think of: sweet, savory, crunchy, creamy, etc! Anyway work was slow this week and I have an online class this semester so I am not running around as much and I figured its time to replicate this salad. Especially because I need to save my money for pedicures. Oyi my feet are looking rough! woof! Ok back to the tasty salad prep. As always this is going to reuse ingredients from other recipes. At CPK they use a champagne vinaigrette, so I grabbed a bottle of the Trader Joe’s pear champagne vinaigrette used in one of our salad recipes and a chicken dish to toss my greens with. Then the beets were in the last salad recipe as well-ha can you tell I really like them?! Might be the new truffle, lol just kidding that would never happen. 1 medium Red bell pepper (try for the same sizes as the beets and avocado). I called this recipe the pseudo salad because its a knock off of the one from the restaurant and its much more filling than a regular old salad. This is meant to be an entrée and that’s why there is a bit more cooking involved than most salad recipes. Anyway its yummy, don’t worry about what the title means, just devour. Doctors say in order to keep your cholesterol in check, one should maintain a diet of proteins that either fly or swim. That means no red meat (get it: cows graze whereas fish swims, turkey flies). This is a healthier way of living and will still get you the nutrients of non-vegetarian food (aka the good protein intake). 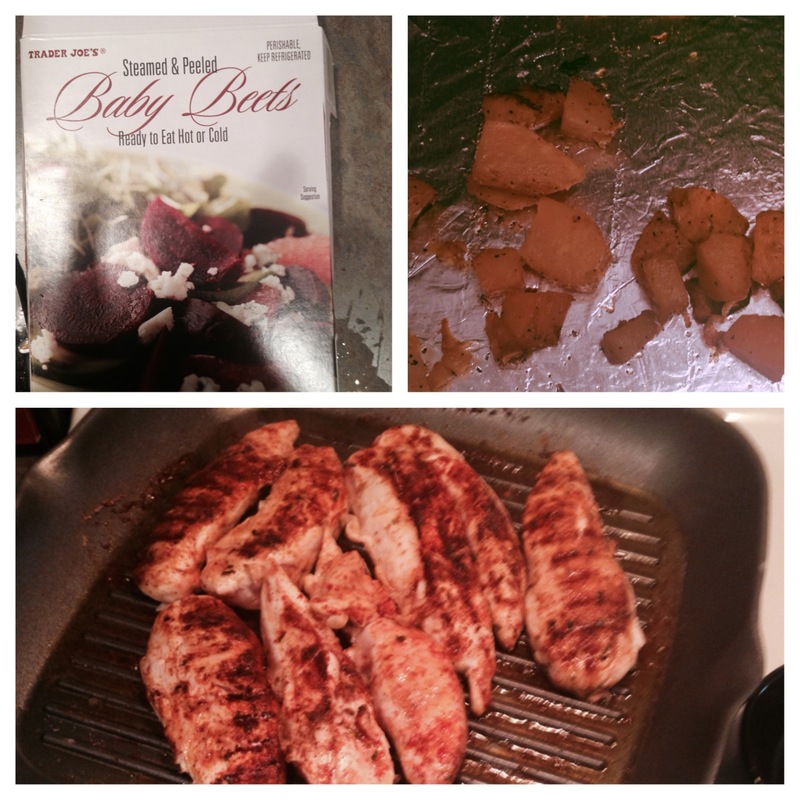 Since I have already shared a salmon recipe, I figured a nice tilapia is just what I needed. This will help to keep us all in our trim, spring break mind set, while still enjoying what we eat. No thanks on the tofu, even if it is deep fried (that’s right Chinese take out, I am talking to you. Don’t act like we don’t all see it there stuffed under our lo mein. No, not that any of us are eating lo mein. Healthy eating…must stay on topic…on diet…flies and swims). Preheat oven to 400 degrees F In the meantime, combine the dry spices with olive oil and create a paste. Set aside. 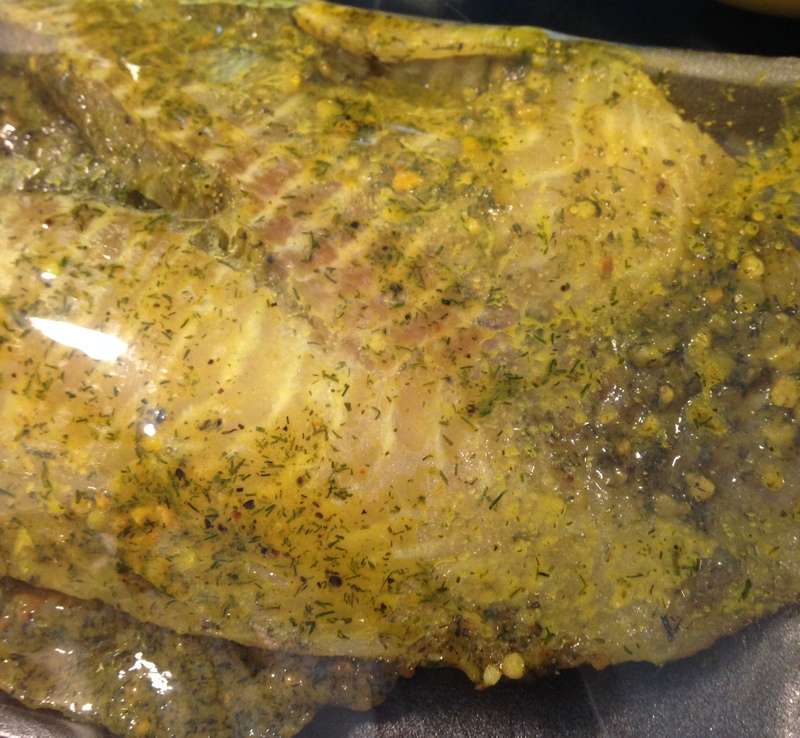 Foil the baking sheet and lay out tilapia fillets. Coat the fish with the lime juice and paste. Bake for 15-20 minutes or until the tops look golden brown. Enjoy! (oh and, think “swims” next time you need a dinner idea. Swims = swimsuit, eat healthy, eat more fish. Preaching over, the end). Preheat the oven to 375 degrees and line a baking sheet with foil or parchment paper. Mix together the oil, salt, pepper, paprika and cheese. Toss in the beans and coat completely. Spread out on the baking sheet and sprinkle a little extra cheese on top. Bake for 15-20 minutes/until brown and crispy. 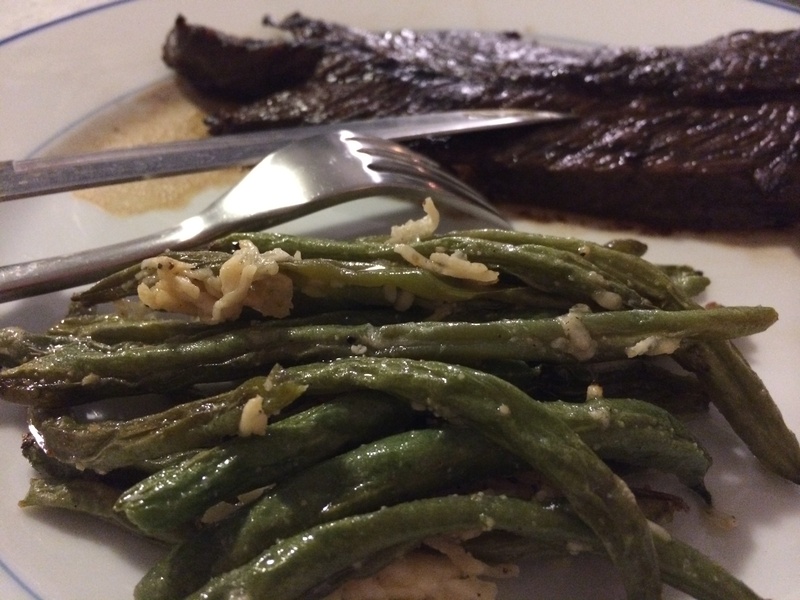 I served this with a sherry vinegar hanger steak (recipe coming soon from one of our awesome contributors!). 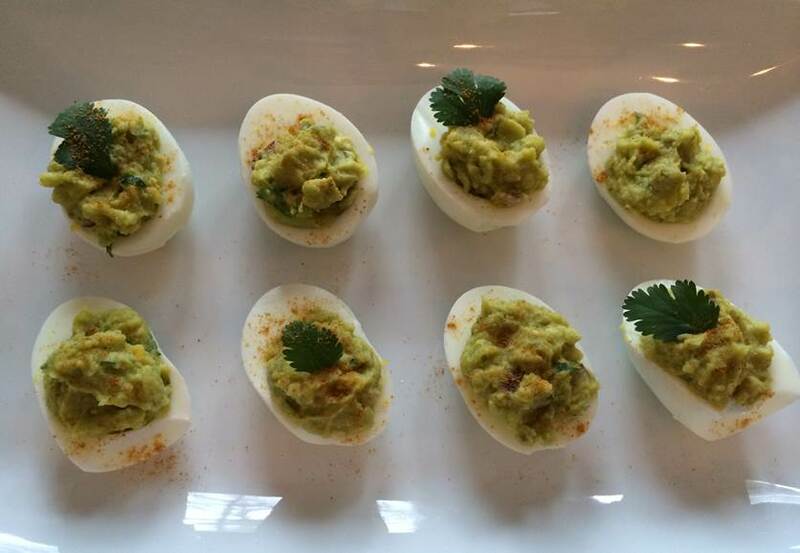 Ok, so here’s my dirty little secret – I’ve never actually made deviled eggs before this recipe. I really really love them, but for some reason thought they were a lot harder to make than they are. There’s that, and also the fact that I was terrible at making hard boiled eggs. (Yes, I know. I started a food blog and couldn’t boil an egg. We all have our vices…). But hold the tisk tisk-ing, because I overcame both and made some super easy and delicious deviled eggs. Look ma! I finally made my own deviled eggs! Take the yolks from the hard boiled eggs and combine with all of the ingredients except paprika. Be sure to blend it until creamy. Scoop spoonfuls back in to the eggs and dash on the paprika. If you want something a little more spicy, try blending in some chili pepper or finely chopped jalapeno. Can’t wait to make these again for margarita night! 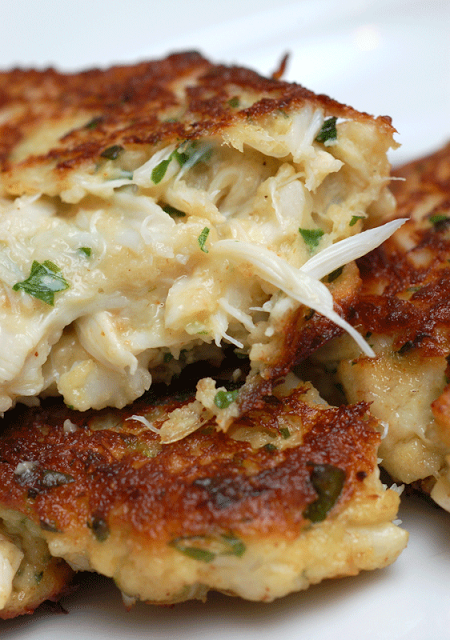 For most of us (ok, maybe I’m just speaking about myself here) but I never dare dreamed I could make a crab cake. That was what the yearly vacation to Philips Seafood and Steak house in Ocean City, MD was for. Well, I recently faced my fear and tried it out. And guess what? It wasn’t that hard at all! Most of the ingredients were already on my shelves. I picked up a few extras from the store and I was ready to go. Refrigerate the mixture for 1 hr. (this is so they don’t fall apart when pan searing, realize this is a legit crab cake. Crab being the star of the show with minimal filler so when cold they won’t crumble in pan or when you have to flip them) and then pan sear for 4 min on each side (makes 4 large or 6 appetizer portion crab cakes) serve w parsley leaves & lemon wedges to class it up. Oh and check out Sauce Boss for an easy, fridge friendly dipping sauce.